Recently, I spoke with Harvard Divinity School Professor Sharon Fennema about the role of art in religion, spirituality and worship. Read on to see what we lose or neglect if we don't incorporate artistic expression in worship. Pierre R. Berastaín: Sharon, you now teach a class at Harvard, Curating the Sermon, which explores the intersection of artistic expression and worship. You wrote your dissertation, however, on the HIV-infected communities in San Francisco. How did you go from that to teaching a class focused on the incorporation of art in worship? Sharon Fennema: Well, I am a singer, so that's my entry point to studying and living out liturgy through music. I was interested in doing a class on preaching that would incorporate the art because that's such a fundamental way that I experienced my own spirituality. Your class centers around Christianity, specifically. What would you say -- for Christianity -- has been the traditional way of incorporating art in religion? From the very beginning of Christianity, we don't really know how much artistic expression was involved in the early rituals, but what we can tell is that a lot of the house churches incorporated artistic expression within their buildings that were related to Christian ritual practice. As we move to the medieval period, the relationship between Christianity and the arts flourishes because there is a sense that you get to know God through what is beautiful. That whole relationships became much more conflicted in the Reformation in the sense that Christians felt they didn't need God to be mediated. You could have immediate access to God, so art was seen as a mediator between humans and the Divine so iconoclasts said, "no more art because we have direct access. We don't need that kind of facilitation." So a lot of the art that was associated with ritual practices and Christian traditions was destroyed, unfortunately, because of that theological basis and ever since then, there has been this conflict within Christianity on how we engage the arts. So where are we now? What is the role of art in contemporary Christianity in the United States? I think that there are two different sides of that equation. In popular culture, art plays an essential role because for a lot of people engaging with art has taken on a religious or spiritual quality. That is, art offers the opportunity to encounter transcendence even in a society where people are not necessarily religiously engaged. So, in a way, secular art offers an entry point into a spiritual sensibility. And, on the other hand, there is a lot more attention to the arts within the context of what one might call traditional religion. For example, a lot of the contemporary movements in Christian worship really value and strive for multisensory worship, and that way of worshipping involves a layering of different artistic expressions, from visual arts, to music, to dance, etc. And all of these different artistic expressions are understood to offer different views and understandings of God, different theologies. So I think there is a real richness in the way that contemporary people engage with the arts, both by finding spiritual resonances within secular art, and by developing a deeper and broader artistic repertoire within Christian churches in the development of multisensory worship. Does that mean that art is more accepted now or does it still meet resistance? I think it depends on the art. There is definitely a suspicion of art, specially, I would say, among more evangelical or more reformation-based traditions within Christianity. This suspicion comes about because of the understanding that art is tied to our emotions and it's anti-intellectual or that maybe, it's giving us access to things that are less Godly. Why do you think the pushback? This is the inheritance of The Enlightenment. Intellect is valued over the emotions, so if you are using art that accesses emotions then that's suspect because it's not governed by the intellect. In terms of accessing the transcendent, of offering a way of thinking beyond the boundaries of ourselves, can you give specific examples of how art has allowed Christians to do just that? I am thinking about contemporary moves in Christian churches to incorporate more global music as a way of singing in solidarity with people who are within the body of Christ but distant from us -- location wise. To me that's one way of incorporating the arts of another culture into our worship as a way of cultivating the sense of who we are as the body of Christ and that expands our view of who God. 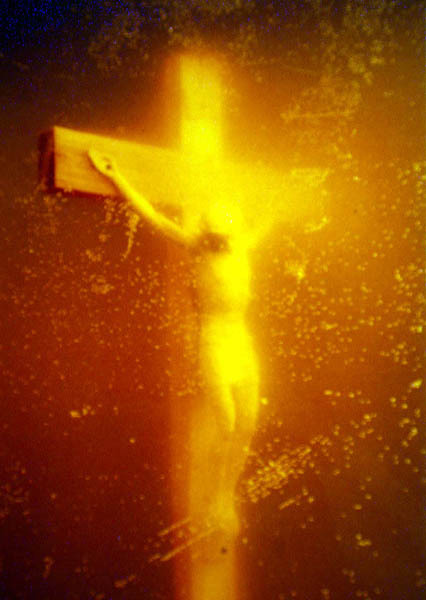 Perhaps a more controversial example would be [Andres] Serrano's Piss Christ, which is a crucifix that is immersed in a vile of the artist's urine and then photographed. The actual piece of art is that photograph. That is a great example of art that confronts us, that disturbs our common association [of the crucifix]. Serrano's own interpretation is that he wanted to call attention to this sort of horror of the crucifixion by shocking us into seeing it differently. This is a great example of how we can be disturbed by art to re-understand or re-imagine something that seems tamed to us. This art reminds us of the real horror of what crucifixion was and what a political execution means for us as Christians. I asked you before whether there is resistance to incorporating art in religious services, and as you talk about Piss Christ, I can see why people would be resistant. Yet, can you see something like Piss Christ be incorporated in service? Can you imagine that it would be tactfully and respectfully incorporated in worship? I do! To me, and this is my own view and probably people will disagree, but I think part of our job as worship leaders is to challenge people and to disrupt the unthinking engagement with our faith and to deepen it. And so I think a piece like that might make us uncomfortable as much as it might challenge us. That's the point. Worship is supposed to challenge us to think differently, to challenge us to deepen our connection and our spirituality, and I think a piece of art like that can do that. To me it's [about] finding the balanced of when you have pushed a little too far. You would have to find the right context. It would have to be the right kind of congregation to be able to engage that. So in terms of art, why is using bodily fluids not pushing it too far? I mean, this reminds me of Andy Warhol's' piss paintings. So why is that not too far when it comes to religion? To spirituality? Why are our fluids OK? For me the Christian doctrine of incarnation is that God is there in our bodies and that includes our bodily functions. So I don't think that would exclude [something like Piss Christ] from being incorporated within worship because it's part of human life. That particular artistic expression is meant to be jarring and disrupt and to really bring into view the horror and tragedy that is the crucifixion and I think that is a good thing to be reminded of. I just wonder whether that's the best way to remind us of that horror. But let me ask, if we are to use art, what is at stake if we do not incorporate it in religious practices? What are we missing? One thing that art offers us is the possibility for expanding our imagination beyond what we would normally engage with. So one thing we lose is that. I think the other piece we lose is is the multivalency of God. Art gives us access to many different way of engaging and understanding God all at the same time and I think that is really valuable when engaging with a God who is beyond our understanding. Earlier you mentioned that we are coming into contact with different cultures and beliefs because of art. Does art have a special ability to convey different understandings than, say, liturgy alone does? [Art] gets us out of the discursive, which is so often what traps people, and we find it hard to understand our differences when we are only using verbal language. Global music, for example, gives us a way of participating in another culture -- even from our perspective -- so [we] are engaging with differences in a unique way. You are not just distant and looking at it. You are embodying it. I think where that becomes difficult is with the question of appropriation. Are you taking someone else's culture without understanding and engaging actual people in that culture or are you just taking it because it's cool? That's where it can be problematic. Right. What you are saying, then, is that art can facilitate non-verbal conversations for a different understanding. Precisely. We can create empathetic bridges to identities we do not understand. When I see a different gender construction performed in drama, there is a relationship created there. When I hear a poem about an immigrant's experience in the U.S., there is a relationship created there. When is see a mural that depicts the civil rights struggle in Birmingham, Ala., there is a relationship between historic experience and my own experience. Professor Fennema received her Ph.D. in Liturgical Studies from The Graduate Theological Union in Berkeley, California. She now lectures on ritual, liturgy, and preaching at Harvard Divinity School.